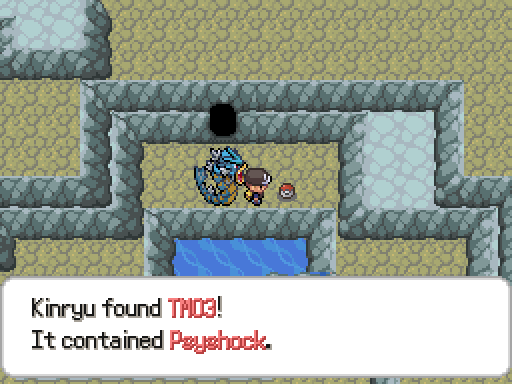 TM03 Psyschock - Found in Thunder Underroute. TM07 Hail - Obtainable from the Blackfist Dept Store, 3rd Floor. 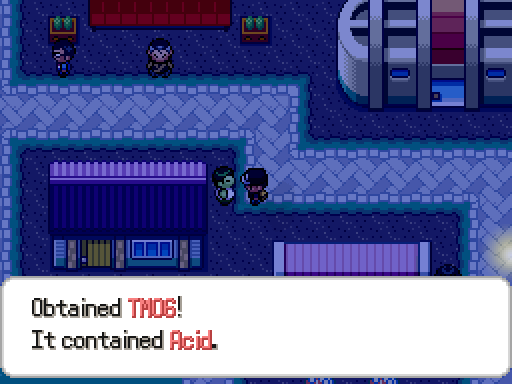 TM06 Acid - Give an Antidote to the Green Man in Superior City. 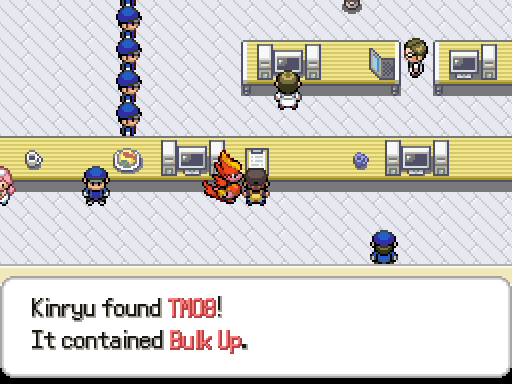 TM08 Bulk Up - Found on a clipboard by Nurse Joy in the Asgard Base. 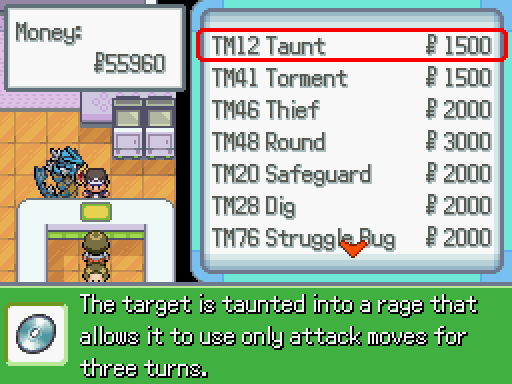 TM12 Taunt - Obtainable from the Blackfist Dept Store, 3rd Floor. 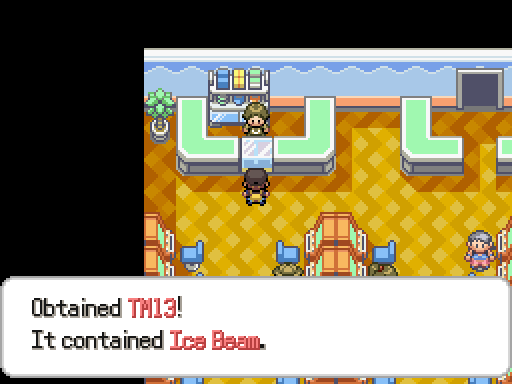 TM13 Ice Beam - Obtained from the Treader Game Corner for 4000 coins. 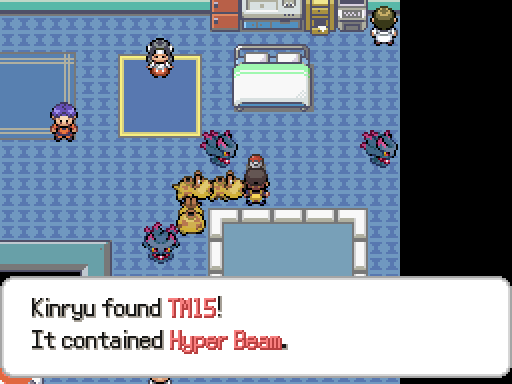 TM15 Hyper Beam - Available from the pokéball in your secret base. 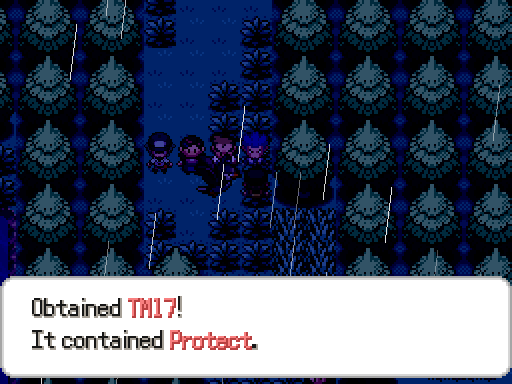 TM17 Protect - Obtainable from Cyrus on Route 307 immediately after viewing the cutscene. As it is easy to miss, it is also obtainable via the Mystery Gift code "protect". 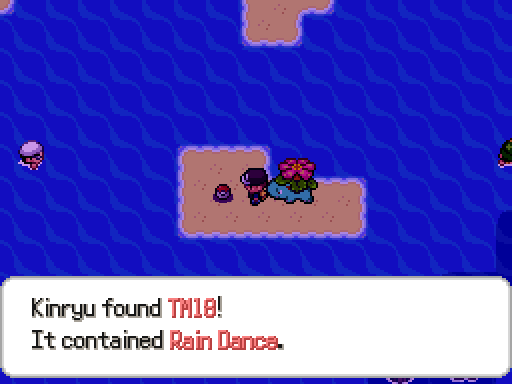 TM18 Rain Dance - Found on a sandy patch in the middle of Route 311. 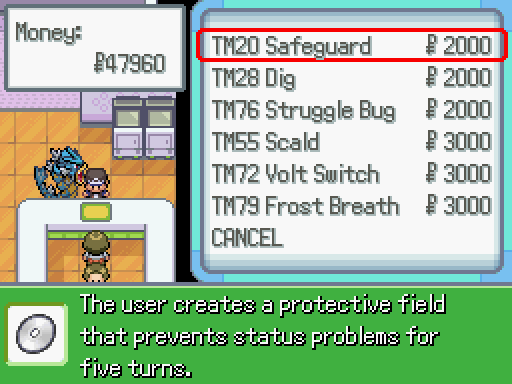 TM20 Safeguard - Obtainable from the Blackfist Dept Store, 3rd Floor. TM21 Frustration - Received from the woman in the southernmost house in Agassiz. TM23 Smack Down - Obtained from the Treader Game Corner for 3500 coins. TM24 Thunderbolt - Obtained from the Treader Game Corner for 4000 coins. 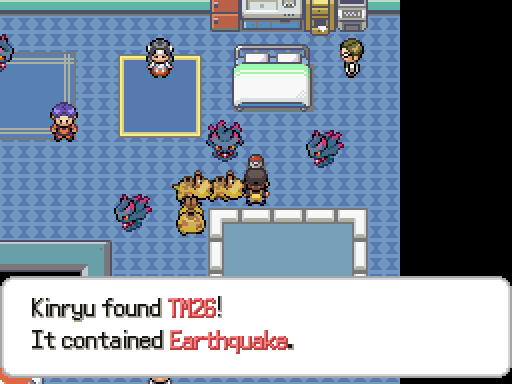 TM26 Earthquake - Available from the pokéball in your secret base. 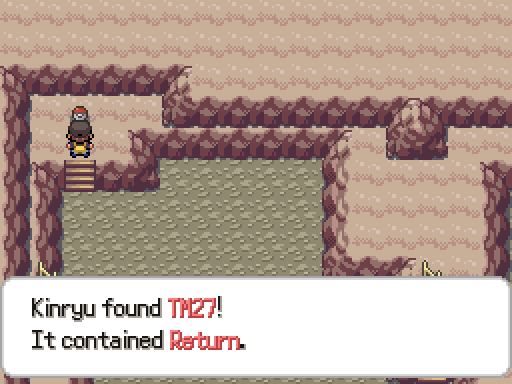 TM27 Return - Found on Route 309, just Northwest of the Heart Scale miner. TM28 Dig - Obtainable from the Blackfist Dept Store, 3rd Floor. 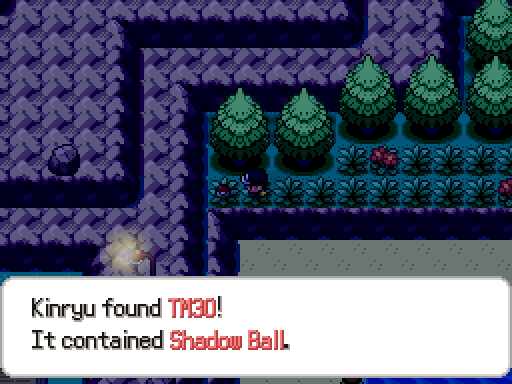 TM30 Shadow Ball - Found in Kivu Town, in a grassy patch at the northern end of the beach. 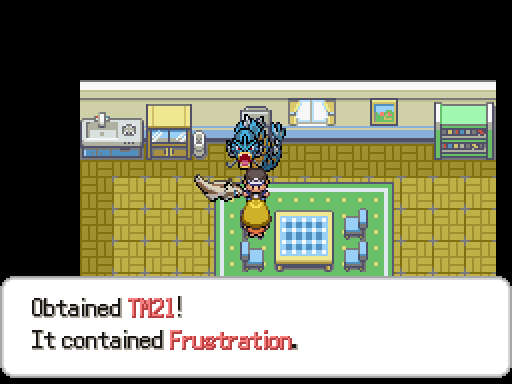 Also obtainable from the Treader Game Corner for 4500 coins. 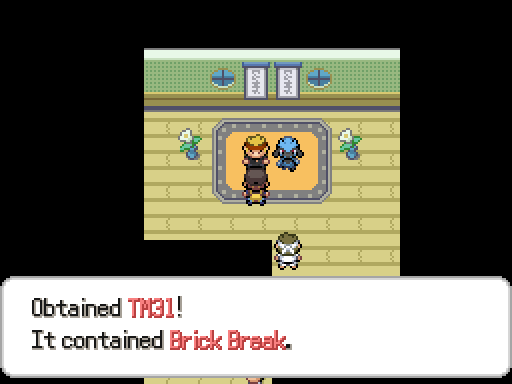 TM31 Brick Break - Received upon defeating the Superior City Gym. TM35 Flamethrower - Obtained from the Treader Game Corner for 4000 coins. TM41 Torment - Obtainable from the Blackfist Dept Store, 3rd Floor. 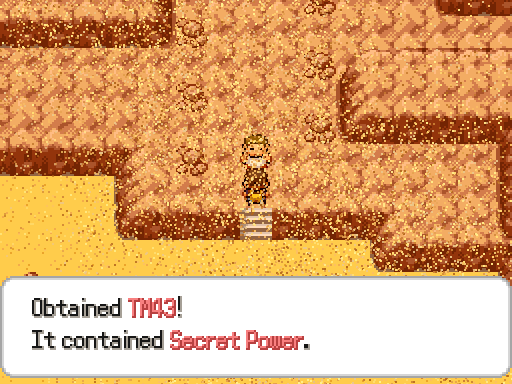 TM43 Secret Power - Received upon receiving your Secret Base at the Northeast corner of Agassiz. TM44 Rest - Found on a clipboard near Ash in the Asgard Base. TM46 Thief - Obtainable from the Blackfist Dept Store, 3rd Floor. TM48 Round - Obtainable from the Blackfist Dept Store, 3rd Floor. 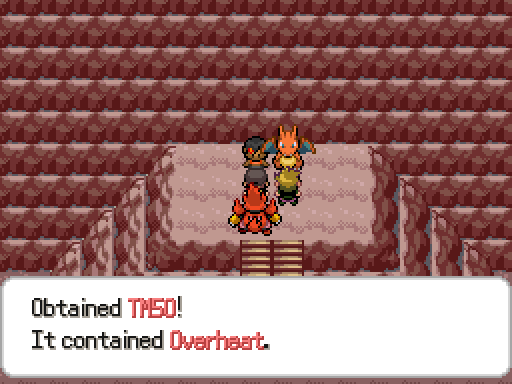 TM50 Overheat - Obtained upon defeating the Caspian Gym. 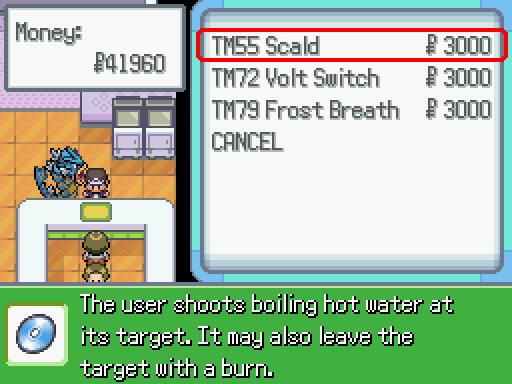 TM55 Scald - Obtainable from the Blackfist Dept Store, 3rd Floor. 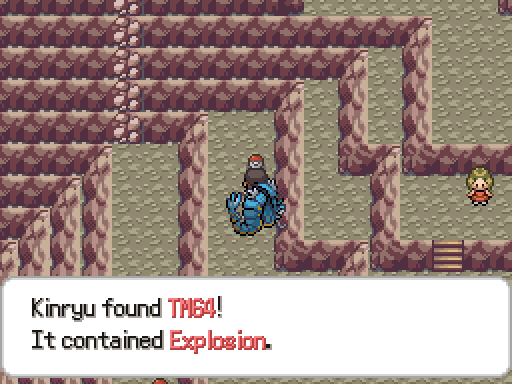 TM64 Explosion - Found in Mt. 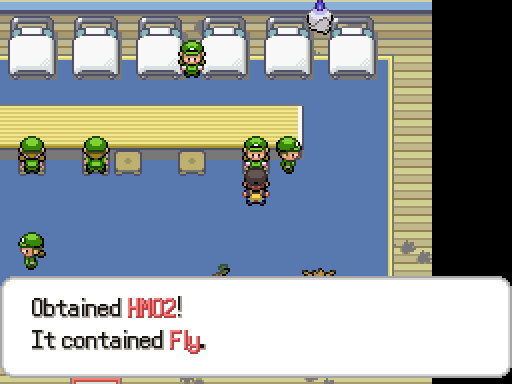 Press L3, the first cave past Nurse Joy. 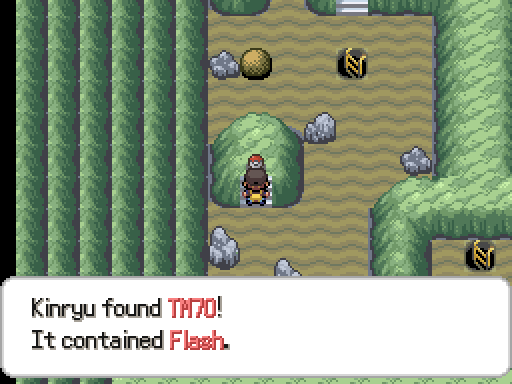 TM68 Giga Impact - Received from an Asgard Grunt after hearing his story and spelling out his name: "ASH"
TM70 Flash - Found in Wonder Cave on the lit floor right by the ladder. TM72 Volt Switch - Obtainable from the Blackfist Dept Store, 3rd Floor. 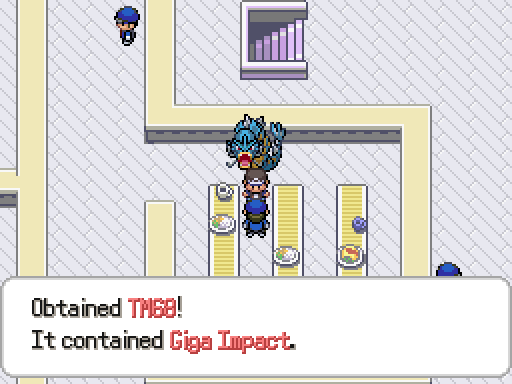 Also obtained upon defeating the Maggiore Sigil Hall. 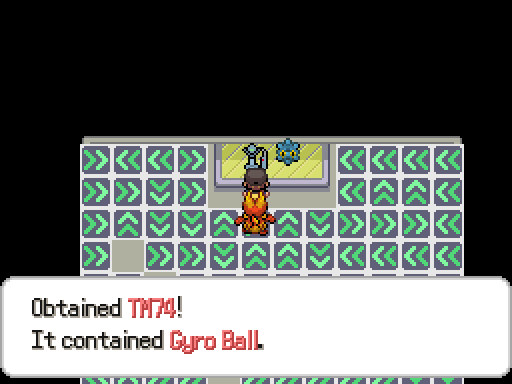 TM74 Gyro Ball - Received upon defeating Fianga City Gym. 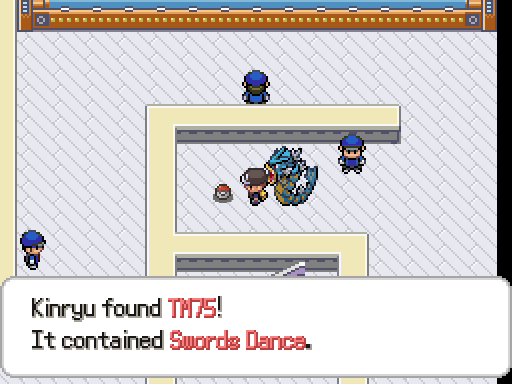 TM75 Swords Dance - Found in the Asgard Base. TM76 Struggle Bug - Obtainable from the Blackfist Dept Store, 3rd Floor. TM78 Bulldoze - Obtainable from the Blackfist Dept Store, 3rd Floor. 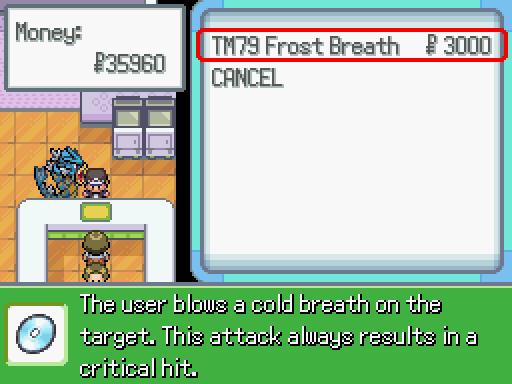 TM79 Frost Breath - Obtainable from the Blackfist Dept Store, 3rd Floor. 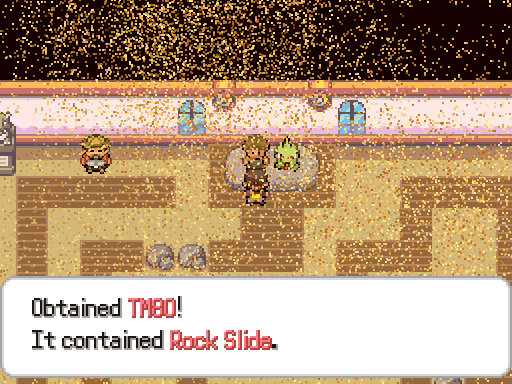 TM80 Rockslide - Received upon defeating Agassiz City Gym. 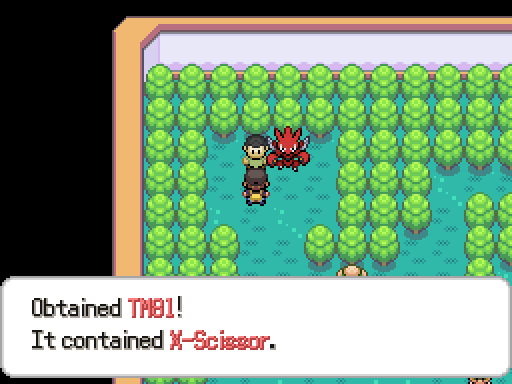 TM81 X-Scissor - Received upon defeating the Treador Gym. 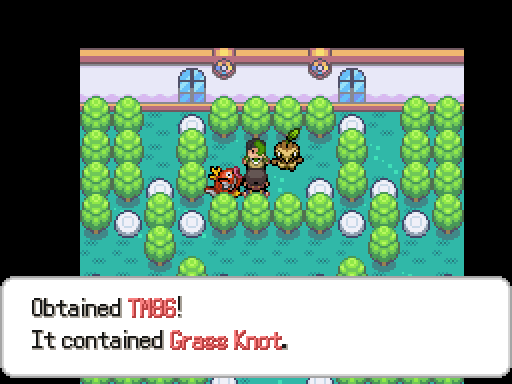 TM86 Grass Knot - Received upon defeating the Onega Gym. 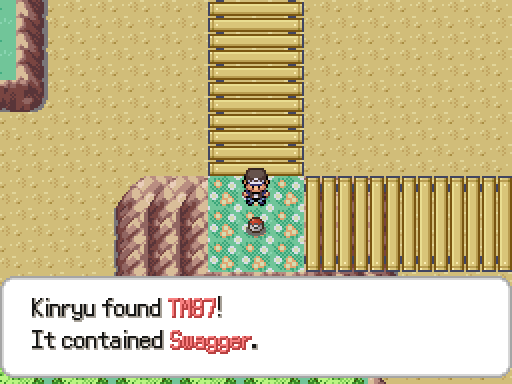 TM87 Swagger - Found on a hill connecting the two bridges on route 312. 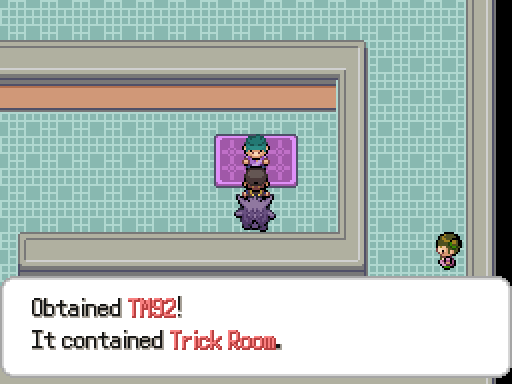 TM92 Trick Room - Obtained upon defeating the Blackfist Gym. 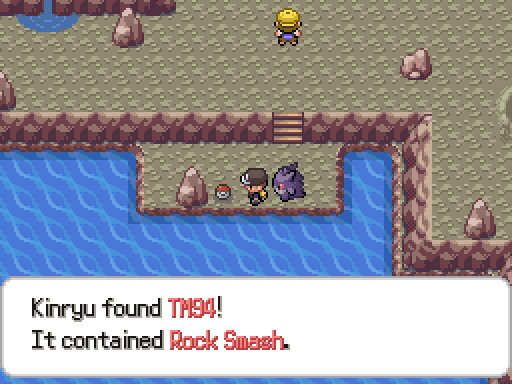 TM94 Rock Smash - Obtained in the Blackfist Safari Zone. 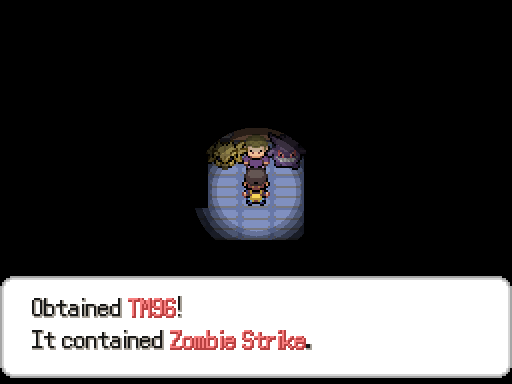 TM96 Zombie Strike - Received upon defeating the Kivu Gym. 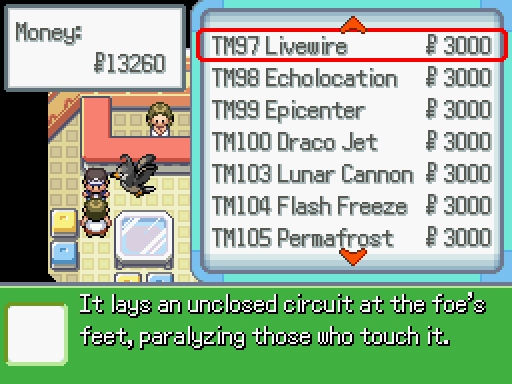 TM97 Livewire - Obtainable from the Nuzlocke shop in Fianga City (Nuzlocke only). TM98 Echolocation - Obtainable from the Nuzlocke shop in Fianga City (Nuzlocke only). TM99 Epicenter - Obtainable from the Nuzlocke shop in Fianga City (Nuzlocke only). TM100 Draco Jet - Obtainable from the Nuzlocke shop in Fianga City (Nuzlocke only). TM103 Lunar Cannon - Obtainable from the Nuzlocke shop in Fianga City (Nuzlocke only). TM104 Flash Freeze - Obtainable from the Nuzlocke shop in Fianga City (Nuzlocke only). TM105 Permafrost - Obtainable from the Nuzlocke shop in Fianga City (Nuzlocke only). TM106 Medusa Ray - Obtainable from the Nuzlocke shop in Fianga City (Nuzlocke only). TM107 Dark Matter - Obtained upon defeating the Dojran Sigil Hall. TM109 Power Shrine - Obtainable from the Nuzlocke shop in Fianga City (Nuzlocke only). TM110 Special Shrine - Obtainable from the Nuzlocke shop in Fianga City (Nuzlocke only). TM113 Fumble - Obtainable from the Nuzlocke shop in Fianga City (Nuzlocke only). 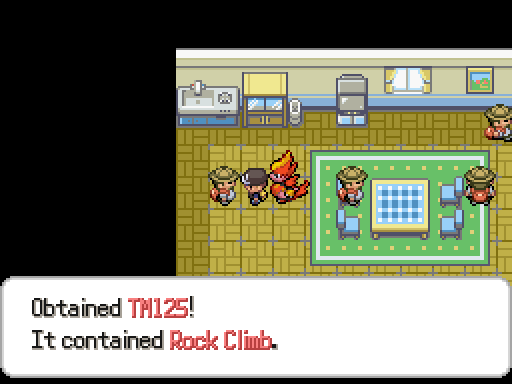 TM125 Rock Climb - Obtained from the Unofficial Hikers Club in Maggiore City. TM?? 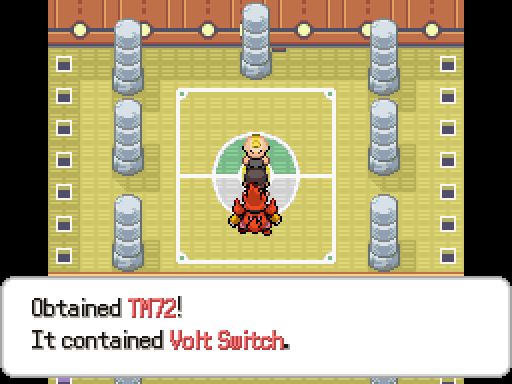 Dark Epitaph - Available from the pokéball in your secret base. 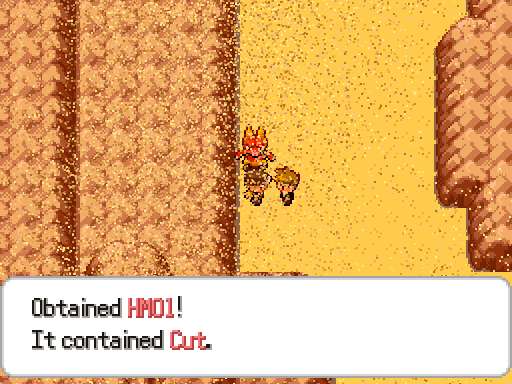 HM01 Cut - Received from your rival after you defeat him on Route 308.5. HM02 Fly - Received from a female ranger in the Kivu Town Ranger Club (blue roof) if you tell her you're a ranger. 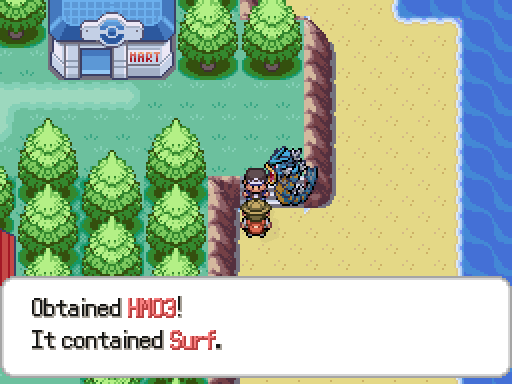 HM03 Surf - Received from Jeremy on the Kivu Town beach after beating him after beating the Kivu Town Gym. 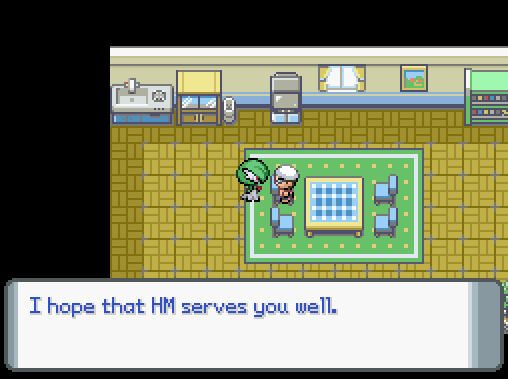 HM04 Strength - Received after talking to the Mother Hypno in Naragex Forest after both speaking to the woman in the western-most house in town and speaking to the man selling the HM for 1,000,000p in the pink roofed house. 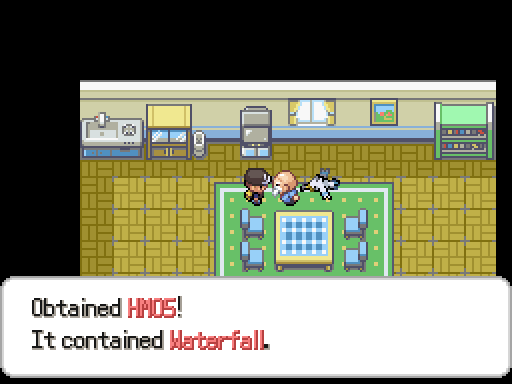 HM05 Waterfall - Obtained from Mr. Briney, who's chasing Peeku around in his house in Treader Town. 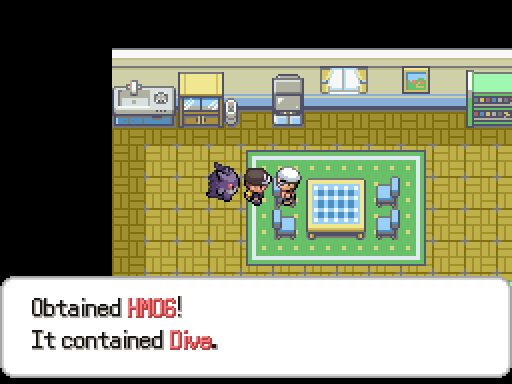 HM06 Dive - Obtained from a swimmer in the southernmost house in Caspian City. Awesome, the initial tester community seems to be coming together. 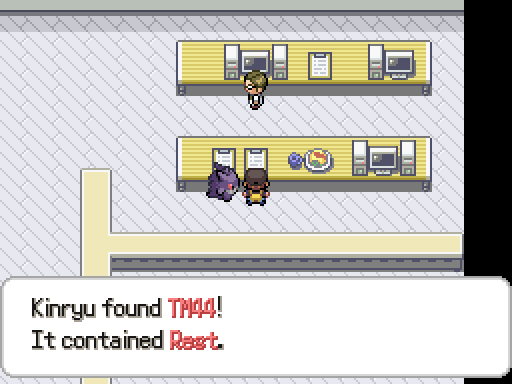 I'm not entirely certain if it is located anywhere but the nuzlocke vendor, but I have found TM?? Dark Epitath from the pokeball in the secret base. Yeah, I've gotten Dark Epitaph. I'll be adding it in soonish, don't worry. But thanks! Again, I'm filling this in as I do my Nuzlocke. 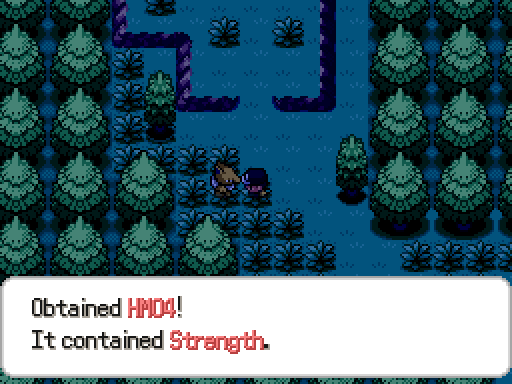 Meaning, in my Nuzlocke ATM, I'm only just past Superior. I will add them all in, I promise. 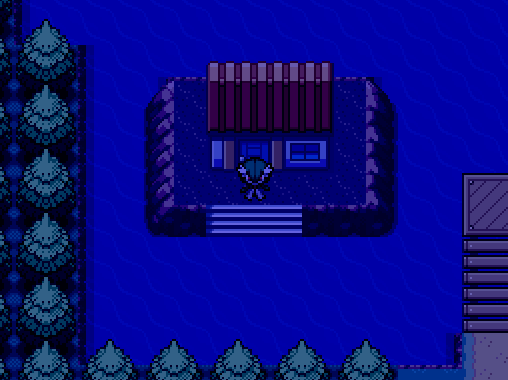 Just give me a day or two to finish the Beta, Nuzlocke style. TM94 Rock Smash is in Blackfist City (I think, not sure). 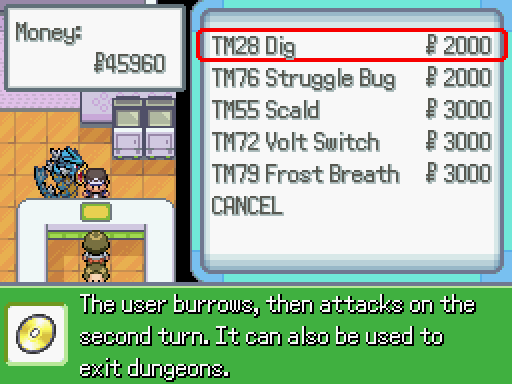 I actually had the Pickaxe before Rock Smash, so I never even used Rock Smash. Blackfist Dept. 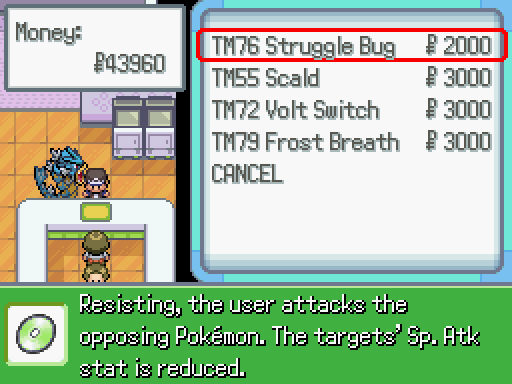 Store currently has Taunt, Safeguard, Dig, Torment, Scald, Volt Switch, Struggle Bug, Bulldoze, Frost Breath. I also have Overheat from the Fire Gym (Caspian City) and Trick Room from the Psychic Gym (Blackfist City). Haha, thanks, Menace. I'll remember those and get them as soon as the 1.1.0 hits. I like to have the pictures for the guide and for my file of saved TM pics. That thing is just so beautiful. where can I find dark pulse? Hey bros, does anyone know how to get sylveon? anyone know where calm mind is?